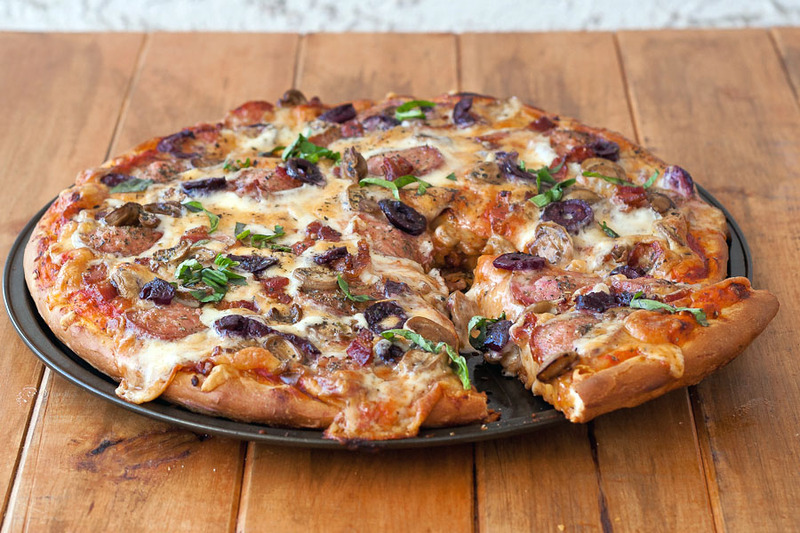 Remember my Easy Pizza Dough Recipe? This is my recipe of choice and it never failed me, not once. I have a 12.5 inches in diameter (32 cm) pizza dish that can completely satisfy a couple, granted that your woman does not eat as much as you, and I only use a ⅓ of the dough I’m making I am not a fan of thick crust pizzas but this time I was in the mood for a little more so I used ½ of the dough :)… and this is what came out of my oven. DELICIOUS! If you have your dough already frozen give it some time to thaw at room temperature and resist the temptation of using your microwave oven for that. Roll it for a bit then you can start to stretch it on your pizza dish. Pour some pizza sauce, which I still buy from the store by the way, and cover the entire surface as evenly as possible. Spread some mozzarella cheese over then add your sausages, thin slices. If you wonder what sausages I got there, the answer is pretty simple, I have no idea. :) I bought them at a Polish store and those guys don’t have labels on anything and when they do it’s in Polish. I assume is something between kielbasa and krakowska but don’t bombard me with questions, it’s all I could find on the WEB :). Anyway, you can use whatever sausage you want. Initially, I was thinking some hot Italian but I went Polish. Next step, the REQUIRED bacon, of course. At least I know the name on this one for sure. Mushrooms, if you want. I used canned here but you can definitely go for exotic and/or unnatural type :). Spread some olives as well, I used huge Kalamata here. Fry the bacon, slice, cut and chop the rest of your ingredients. Do not fry the sausage! Roll the pizza dough, stretch it onto your dish and evenly spread pizza sauce. 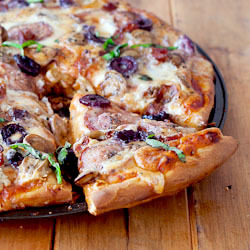 Add in this order: shredded mozzarella cheese, sausage slices, bacon, mushrooms and olives. Bake for 15-20 minutes but watch it like a hawk all this time. Sprinkle some chopped basil and enjoy. Conveniently easy to make…This is such a treat for the whole family.